This past Saturday we installed the counter top to complete our installation of the IKEA cabinets. I purchased the counter top material at RONA, and used their cutting shop to cut the counter top to size and create the 45 degree as well. The RONA service also provides the connecting hardware to secure the two parts of the counter together. We just squirted on some glue and bolted the two halves together. The hardness part was flipping the unit over and putting it in place -- it was an exact fit hence it took a bit of grunting to get it in place. 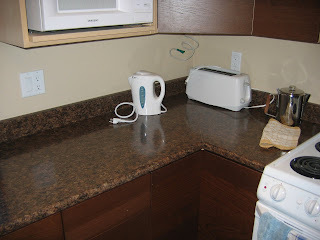 With a few supporting blocks in strategic places, and a handful of screws, the counter top was solidly in place. It kinda' looks homey doesn't it! Measure every conceivable dimension for the countertop! Often your cupboards are not square either! Remembers that you need to have each exposure end of the countertop finished. For instance, where the stove goes. Make sure you have enough support under the countertop. This usually required 5/8-inch material.